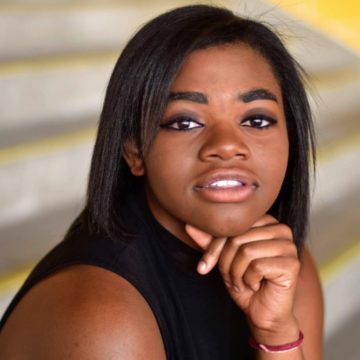 New-Jersey-born and Nebraska-raised, Tehillah Alphonso is currently a second-year student at the University of Southern California, where she studies Popular Music Performance with a vocal emphasis in the Thornton School of Music. Though music was introduced to Tehillah at the early age of 3 years old, her musical endeavors began in 2014 with her acceptance into A Cappella Academy, a teen summer intensive founded by Ben Bram, Robert Dietz, and Avi Kaplan, designed to train and mentor up-and-coming vocal talents in the art of a cappella. Alongside attending Academy for the next two years, she has also had the privilege of performing in Carnegie Hall as a part of the 2015 Honors Performance Series Choir and in the New World Center in Miami as a 2016 YoungArts Popular Voice finalist. Tehillah serves as a member, arranger, and co-director for USC’s premiere a cappella group and four-time ICCA champions, the SoCal VoCals. She also works as a part-time session singer and pianist, singer-songwriter, and performer in her free time. Tehillah is ecstatic to be a part of Snowfall and cannot wait bring holiday cheer to the community of Los Angeles!